Have you ever pictured yourself sitting in a bubbling Jacuzzi on the bow of a superyacht, hosting an elegant cocktail and canapé party on deck at sunset, or diving off a yacht’s swim platform into crystal clear Caribbean waters? The exciting sale of motoryacht Constellation is an opportunity to do all of that, and a whole lot more. The impressive Constellation yacht for sale is a fine example of the Westport brand – one of the great American yacht builders. At 130 feet (39.62m), Constellation was launched in 2007 as part of the hugely successful 130′ series, and has been impeccably maintained by a single owner ever since, with very low mileage and purely private use ensuring that this yacht presents to her new owner in perfect condition. 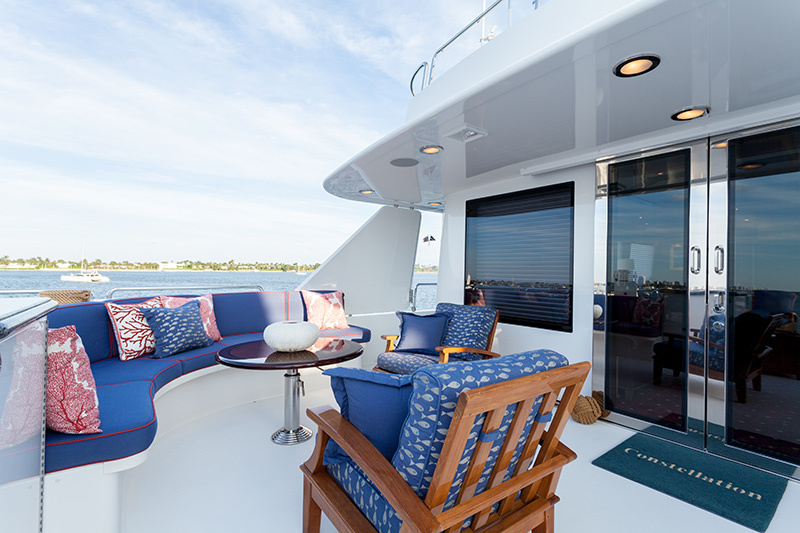 M/Y Constellation accommodates eight guests in four spacious and well-appointed staterooms, including a full-beam master suite with adjoining lounge/office area, two king-sized VIP cabins, and a twin cabin. The interior décor of mahogany and rich reds carries throughout the yacht, from the salon of soft creams and red coral prints, to the beautiful formal dining room seating ten, and up to the sky lounge with comfortable couches, games table, deep red carpets and a study nook with wooden desk and leather chair surrounded by mahogany panelling – all of which evokes a ‘gentleman’s yacht’ feel. 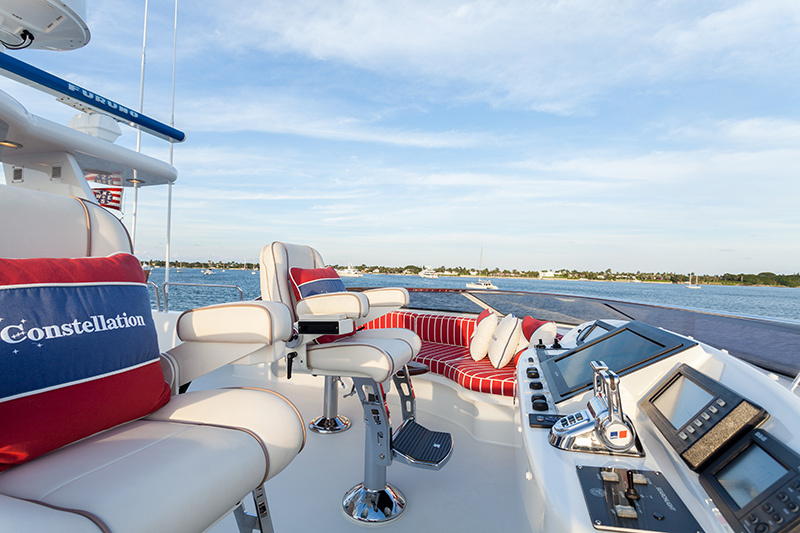 Despite the classic elegance of the décor, the yacht sports all the modern technology you could ask for, including a state-of-the-art Crestron entertainment system and flat screen TVs throughout. 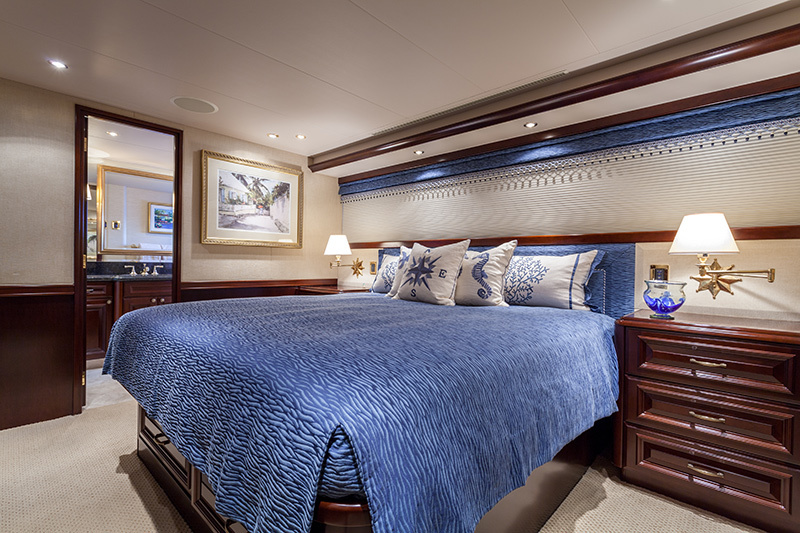 Other sensational features of Constellation’s interior include a gym and sauna/steam shower conversion in the fifth stateroom space, stunning makore inlay flooring, and an open galley for watching the chef at work – complete with a breakfast bar with a sea view for casual meals. 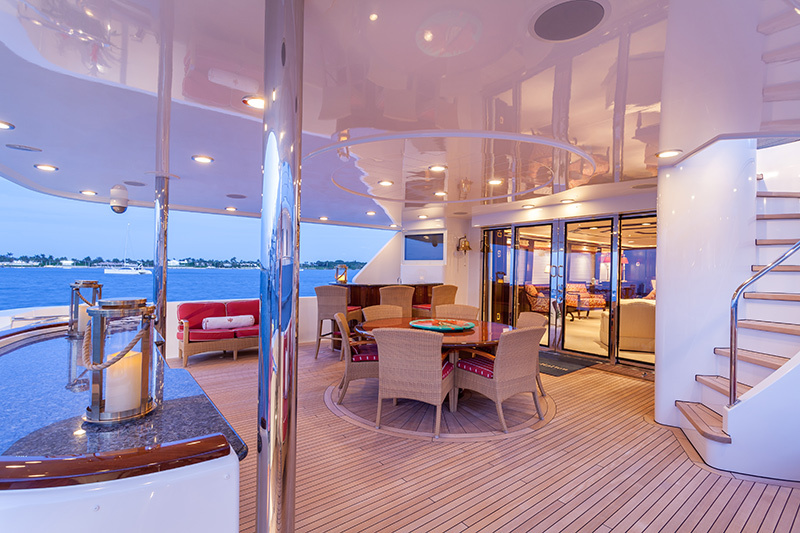 The special features continue on the exterior of the yacht, with glamorous dining and relaxation areas on all decks, as well as the spectacular Jacuzzi on the foredeck and the cushioned seating area on the bow for enjoying the views and sea breezes underway. 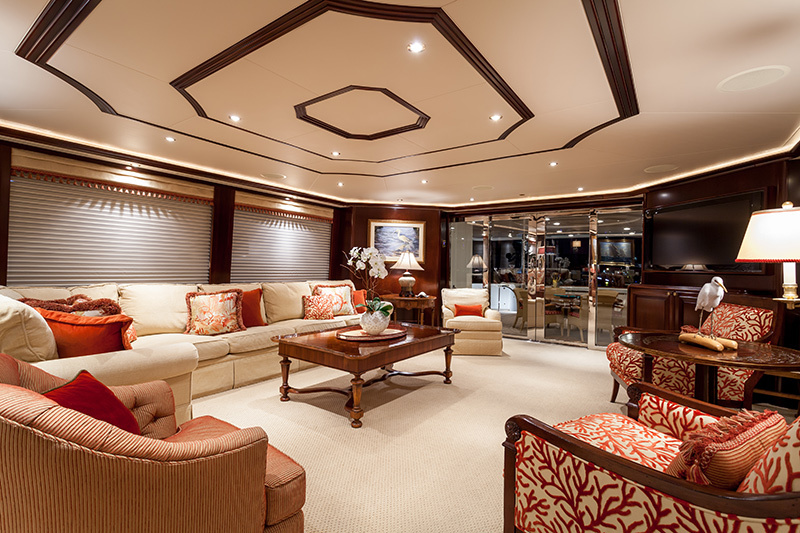 M/Y Constellation is an impressive machine as well as being a luxurious floating home. She reaches reaching speeds of 20 knots from her two MTU/DDC 12V4000 engines, which as of June 2016 had only 3,600 hours. With such low miles on the clock, M/Y Constellation represents an ideal purchase for someone looking to buy a high quality American-built yacht in perfect condition. 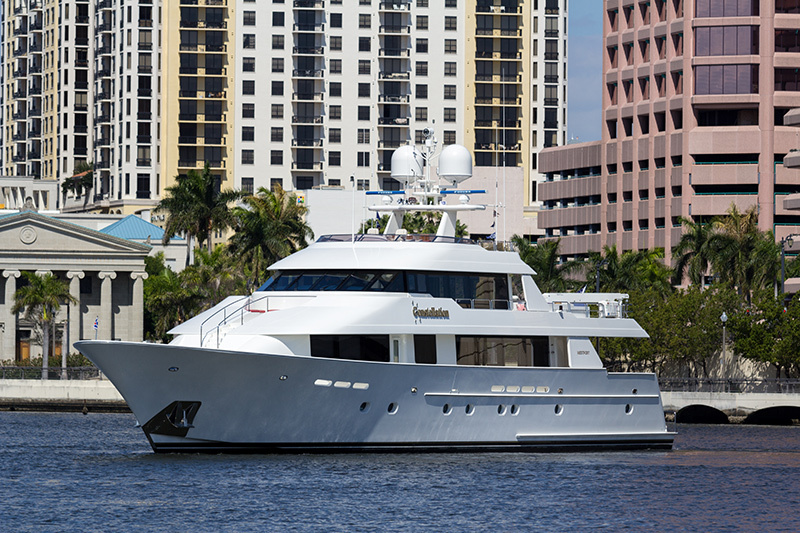 Constellation is currently located in West Palm Beach and is on the market for $8,995,000 USD. To find out more about M/Y Constellation or any other yacht in the Worth Avenue sales fleet, contact the expert team at Worth Avenue Yachts for a chat.